How’s everyone dealing with the mountains of candy? Ivy over at Home Ec 101 gives some quick tips on Controlling the Sugar Rush. And Megan Jeffrey has some fun finger puppets on her site, if you’re into crafting. One more thing, Does anyone have any good resources for putting on a Shadow Puppet play? I was looking around today and couldn’t find anything. 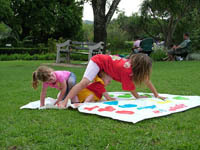 One child is seated on the ground with his legs under him and the other players form a ring round him. They then pull him about and give him little pushes, and he must try and catch one without rising from the floor. The child who is caught takes the middle, and the frog joins the circle.